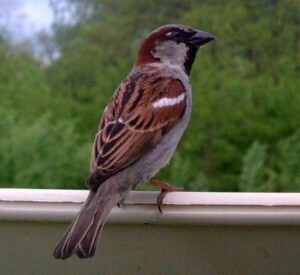 How can I tell if the bird I’m seeing is a House Sparrow? 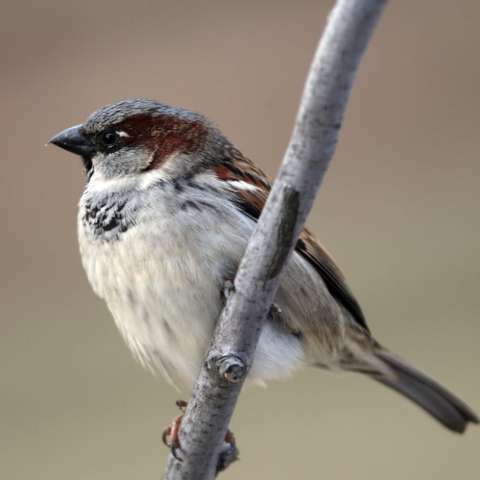 What’s so bad about House Sparrows? 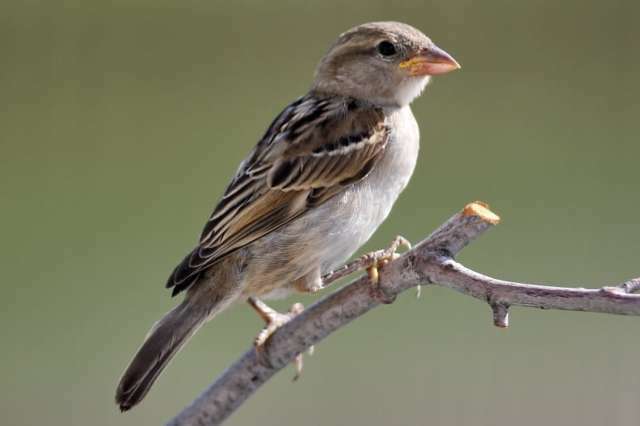 How can I discourage House Sparrows (HOSPS) from coming into my yard? 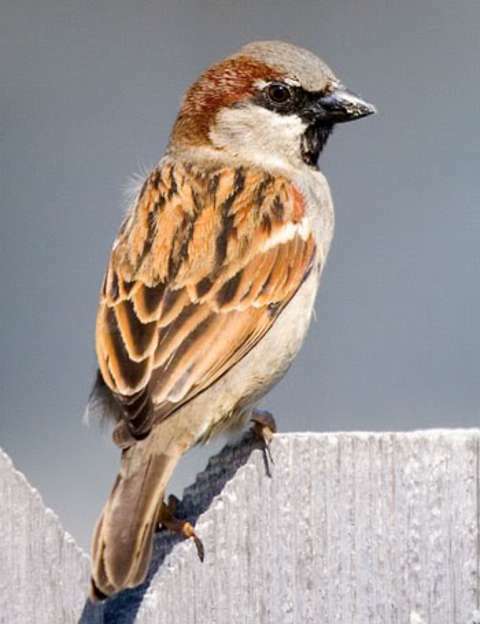 How can I keep House Sparrows (HOSPS) from taking over the Bluebird boxes? 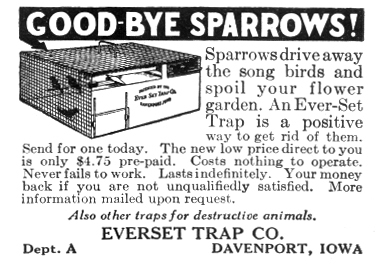 How can I trap House Sparrows? When should I start trapping Sparrows? What should I do with the House Sparrows that I have trapped? When do I put up the Sparrow Spooker? I’ve heard of using Fishing Line to discourage House Sparrows. Does this work, and how do you do it? What other birds compete with Bluebirds at the nestbox? The male House Sparrow has a very distinctive appearance, with his black “bib”, grey head, and brown neck. The female can be harder to identify, but with practice, it can be done. 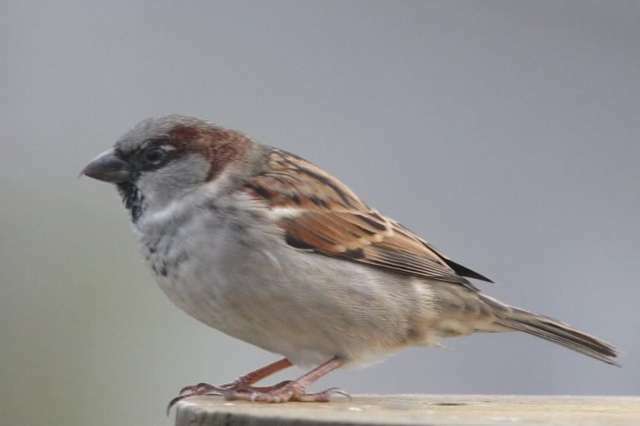 Please click on the HOSP below to start a slide show with more HOSPs of House Sparrows, male and female, and House Sparrow nests, which will help you to identify whether what you’re seeing is a House Sparrow or not. Another view of the deadly beak. Photo courtesy Dave Kinneer. 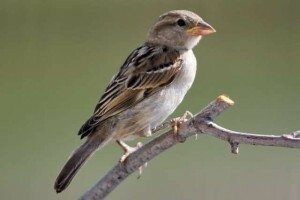 Female House Sparrow. Photo courtesy Tom Grey. 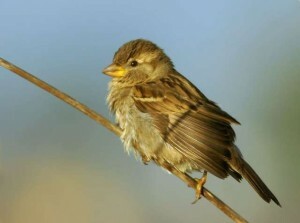 Female House Sparrow. Photo courtesy Dave Kinneer. Another female House Sparrow. (Male in back) Photo courtesy Dave Kinneer. Female House Sparrow – another view. Photo courtesy Dave Kinneer. House Sparrow Egg laid in a box where a Bluebird had started a nest. Photo courtesy Evelyn Cooper. 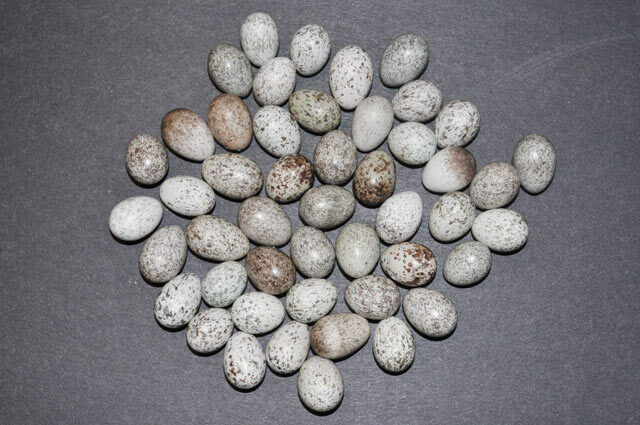 House Sparrow Eggs, showing variation in color. Photo courtesy Mary Roen. Some of the HOSPs in this slide show appear on our discussion forum, The Bluebird Nut Cafe. Not all the HOSPs were credited in the thread they were taken from. If you recognize one of these HOSPs as yours, and there is no credit given, please contact us so that we may give proper credit for the photos used here. If the bird does not look like the ones pictured here, you may be seeing a House Wren. 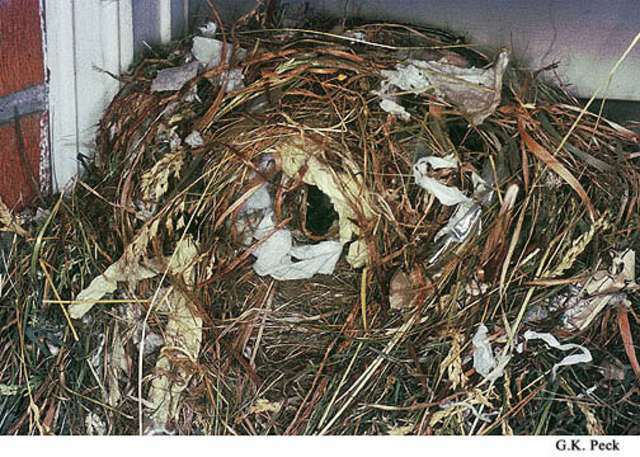 In addition, the birds started taking over the nesting sites of the native cavity-nesting birds, causing a dramatic drop in the population of native birds, most notably the Bluebird. 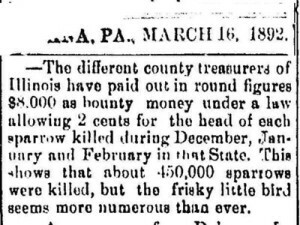 The House Sparrow is prolific and ruthless. It will destroy Bluebird eggs, incubating adults, and nestlings, sometimes building its own nest right on top of the bodies of its victims. 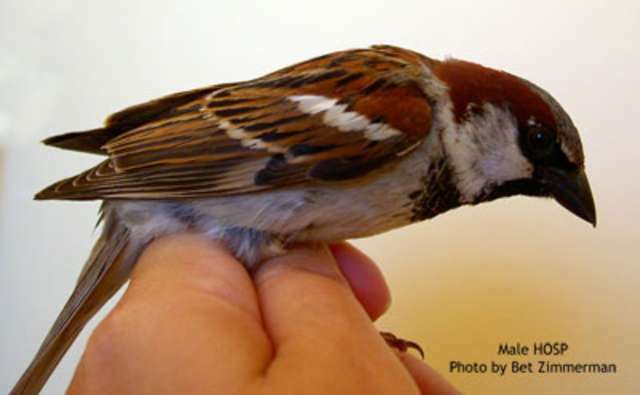 See the article Nothing But Trouble by Ed Nied for an extensive discussion of the House Sparrow problem. 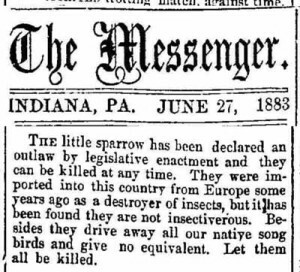 Several articles and advertisements from the late 1800’s to early 1900’s highlight the problem House Sparrows were causing to native songbirds even back then. Click through the slides to read the articles. 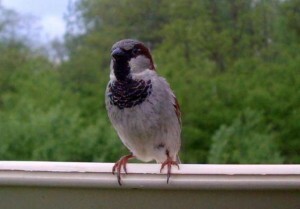 Passive House sparrow management consists of discouraging House Sparrows from feeding and nesting in your yard. This can be done in a number of ways. 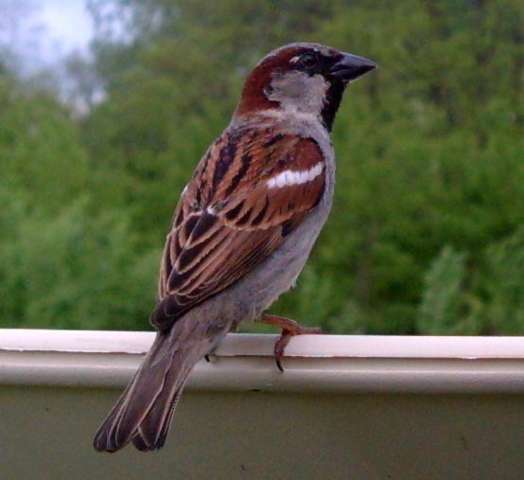 Nestbox placement – House Sparrows like to nest in close proximity to humans. Avoid placing boxes too close to human habitation. 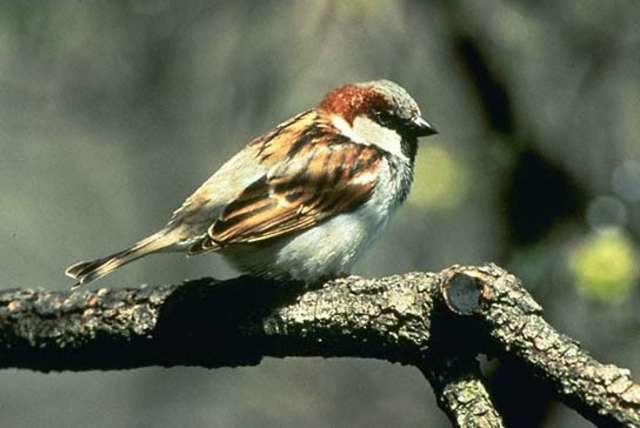 Nestboxes in cities or thickly settled areas will likely be claimed by House Sparrows. Avoid placing boxes near the HOSPS’ natural feeding areas such as barns, silos, grain bins, etc. Nestboxes placed closer than 5 feet to the ground may be avoided by HOSPS, but this method should NEVER be used where there is any risk of predation by cats, raccoons or other climbing predators. Plugging the nestbox entrance hole – If a HOSP has already claimed a nestbox, plugging the entrance hole will prevent it from entering and building a nest. It will not prevent it from looking for another nestbox to claim. Some people plug the entrances to their nestboxes after the last Bluebird nesting to prevent HOSPS from roosting in the box through the winter and then claiming it in early spring. Another option is leaving a box open for one week in the hopes that the HOSP will abandon it. 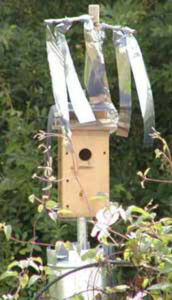 Use of PVC (Gilbertson’s) nestboxes. This is not a certain method, since HOSPS will nest in PVC boxes, but they don’t seem to prefer them. If you are trying to attract Bluebirds in an area where HOSPS are known to be a problem, you might try starting with a PVC nestbox instead of a wooden one. However, be aware that HOSPS will enter the Gilbertson’s box to attack the Bluebird nest, even though they may not prefer to nest in the box themselves. Discouraging HOSPS from feeding on your property. HOSPS love “junk food”! They like the cheap birdseed mixes that contain a high percentage of milo, millet, and cracked corn. Feeding only good Black Oil sunflower and thistle seed may discourage HOSPS from visiting your feeders, and keep them from overwhelming native birds, resulting in more diversity at your feeder. However, HOSPs will eat sunflower seed, so this is not a sure preventive. Never throw out breadcrumbs, donuts, pastries, etc. if you are inviting Bluebirds to nest in your yard. This will only invite their fiercest competitors into close proximity. Some people have also found success with using devices such as the Magic Halo to discourage HOSPS from feeding on their property. Another method that has been suggested and tried by some Bluebird landlords can be read about here: Wing-trimming HOSPs by Fawzi Imad. There has been some success reported with this method. However, the HOSP’s feathers will regrow, and they will still be able to nest in low pines. The only effective solution to a HOSP invasion is to trap and permanently remove the HOSP from its territory. Giving the HOSP “a nestbox of its own” will NOT work. 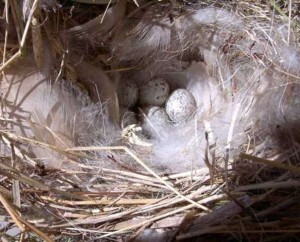 It will try to take over both nests, and is not likely to leave the Bluebirds to nest in peace. Because HOSP will nest in close proximity to other HOSP, it is not possible to saturate an area with enough boxes so other species can safely nest. 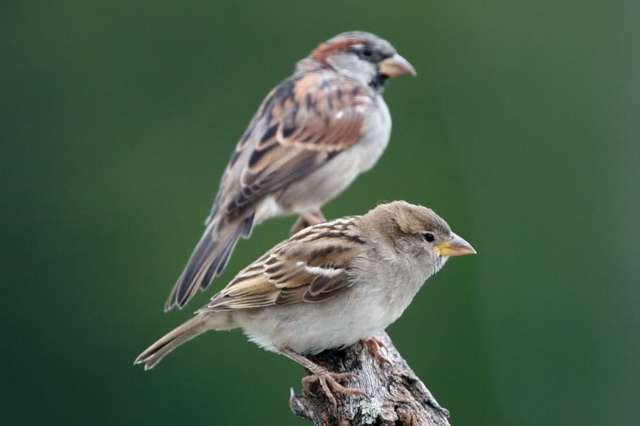 Quoting from the North American Bluebird Society’s website: “Since House Sparrows are classified as pests and are not protected by federal law, they should be quickly and humanely dispatched as soon as they are captured.” This is what is referred to as “active” sparrow management. There are passive methods of control, described above, which basically amount to discouragement tactics. 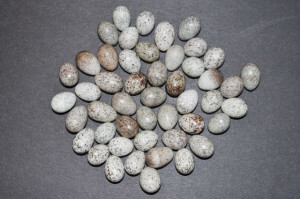 These may suffice in some instances, but be aware that just ONE determined male House Sparrow can destroy a Bluebird nest, killing the babies and perhaps the adults, in a matter of minutes. It is understandable that many people have strong feelings about harming a living creature. 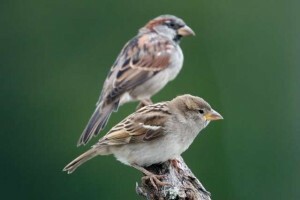 Bird lovers especially have a difficult time with the concept of the necessity for House Sparrow control. Since you are reading this forum, we assume you are a bird lover. However, please understand that many other Bluebird lovers have struggled with this issue before you, and have found that where House Sparrows are abundant, the only truly effective solution that protects the Bluebird is trapping and removal. The trapping and disposal of this non-native invasive species has a long history. Therefore, BEFORE purchasing, mounting and installing a nestbox, you MUST determine whether or not you are willing and able to practice active HOSP control if it should become necessary. If not, then as much as you may love Bluebirds, you should not undertake the responsibility of inviting them onto your property by installing Bluebird housing. It is better to have no box at all than to allow House Sparrows to reproduce in one.You would help the Bluebirds more by making contributions to the national or state Bluebird societies, or helping to educate those in your neighborhood about proper Bluebird landlordship. Gilbertson’s box traps from Steve Gilbertson, HC 5 Box 31, Atkin, MN 56431, (218) 927-1953. Cost is $6/trap plus $1 S&H. Blaine Johnson’s Deluxe Repeating Sparrow Trap – this trap is a tried and tested design, and many Bluebirders are very impressed with its features. Reports from many of our visitors have indicated that the trap is virtually escape-proof, which is important since a House Sparrow that has been trapped and has escaped is often very difficult to trap a second time! 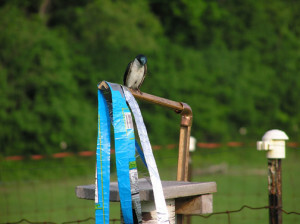 (This trap also works very well on trapping Starlings). 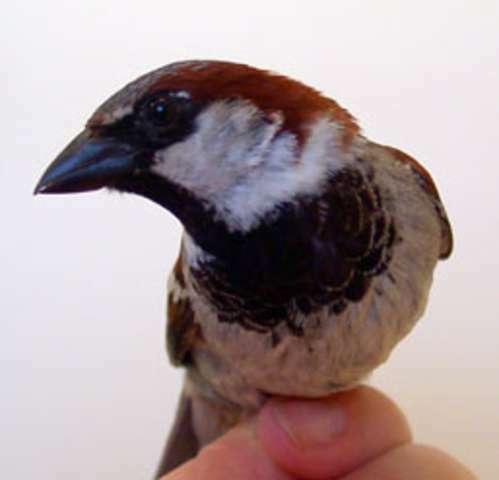 In-box trapping is best done at the beginning of nesting season, when House Sparrows are trying to claim a particular nestbox. Ground trapping, however can and should be done year-round for greatest success in HOSP control. 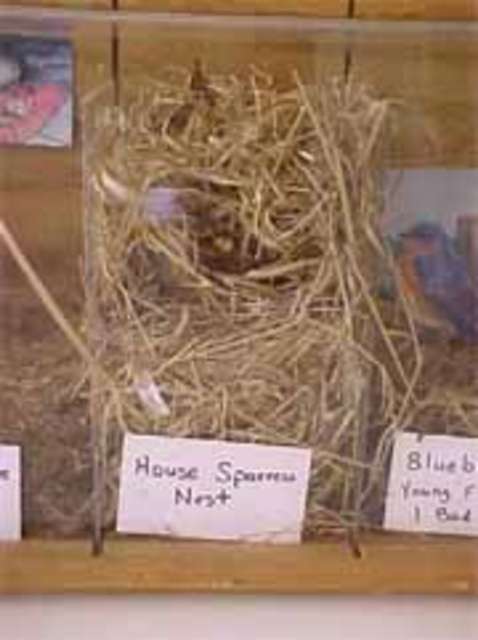 The NABS (North American Bluebird Society) flyer House Sparrow Control states: “Used continuously once the population is under control, its effectiveness, though varied throughout the course of the year, is usually consistent. 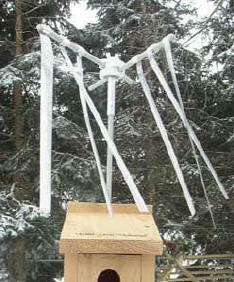 These traps are especially effective during the winter, and when juvenile birds are abundant in mid summer. If using a nestbox trap, the most likely hours to find the male are between 10 am and Noon. This is the time the male usually gives the female a break from incubation duties. Never leave any set trap unattended for any length of time, in case a native sparrow or other songbird becomes trapped. 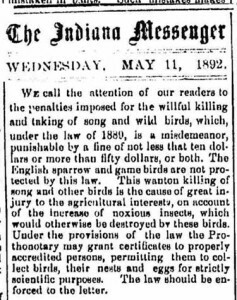 If left unattended, the bird could die. Nestbox traps should be checked hourly, and ground traps at least twice a day. Ground traps should have food and water (you use the food/wager containers available for caged birds.) Native birds must be released immediately. The male House Sparrow is very easy to identify, but the females are quite similar to some species of native sparrows. Check a bird book if necessary. There are a number of websites that offer suggestions and solutions on dispatching HOSPS. Or you may wish to purchase a revised version of the Booklet “How to Control House Sparrows”, by Don Grussing. A sparrow spooker is a device that has proven to be an extremely effective house sparrow deterrent when attached to a Bluebird nestbox after egg-laying has commenced. It is impossible for a Bluebirder to watch a nestbox 24 hours a day, but a sparrow spooker is on duty full-time, from first egg-laying to fledging day. Bluebirders have recognized the life-saving value of sparrow spookers, and some have been constructing makeshift Spookers for the past 22 years. Many variations on the original design have been tried, but the basic premise is always the same – shiny, fluttering streamers suspended above the nestbox discourage House Sparrows from entering the box, but when installed after the Bluebirds are committed to a nesting site (once the first egg is laid) they don’t deter Bluebirds at all. Sparrow spookers can be readily home made, but it is a bit tricky to put the pieces together, get the horizontal pieces at the right height, and keep the mylar from coming off. It can also require some manuevering to mount them so they don’t fall over, and so the mylar brushes the roof top like it’s supposed to. In addition, home made ones tend to not weather well. Finally, some folks just aren’t handy, and wanted a ready-made spooker that could quickly and easily be mounted on any box style “chosen” by a bluebird. 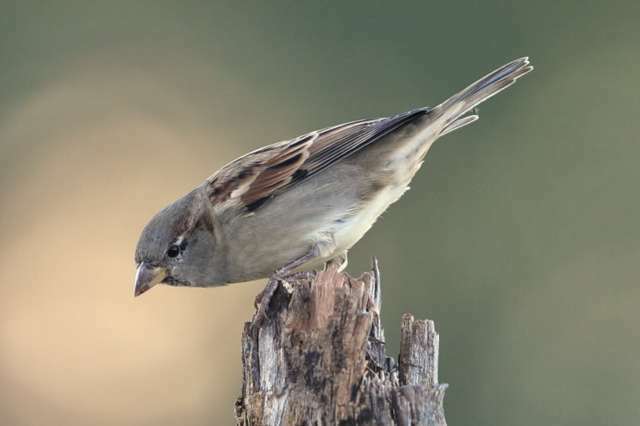 But because of the difficulty involved in creating a design that would be suitable for many different nestboxes and a variety of nestbox mounting solutions, there has not been a commercial version of the Sparrow Spooker available. 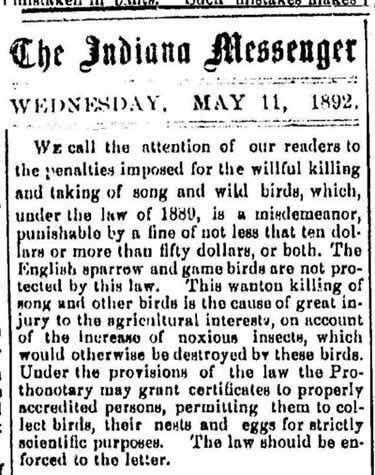 I even tried to interest one popular manufacturer of bird control products in the idea of producing a commercial version – without success. A few years ago some of the Bluebird Nut Cafe forum members approached Blaine Johnson, maker of the Deluxe Repeating Sparrow Trap, to ask if he might be able to come up with a design that would be adaptable to many different nestboxes and a variety of mounting configurations. 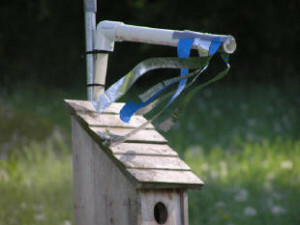 Working along with us, he came up with a version of the Spooker that allows for almost infinite adjustability, making one design suitable for use on a wide variety of nestbox styles – from standard boxes to Peterson and Gilbertson boxes – and also offers quick and easy installation no matter what method has been used to mount the nestbox to a mounting post. Pictured at left is Blaine Johnson’s Universal Sparrow Spooker, available at his Sparrowtraps.net website. Not only is this design almost infinitely adjustable, the spooker is far more attractive and durable than most homemade designs. A hand-crafted design submitted by one of our readers. Evidence suggests that Tree Swallows will also accept Spookers. Not until after the first egg is laid. The Bluebird may seem reluctant to enter the box when it first sees the Spooker, but it usually takes only a few minutes before it gets up its courage to enter the box. It is best to install the Spooker when you have a little time to monitor activity at the nestbox. Watch to make sure the Bluebirds accept it. During egg-laying, the female is not in the nest all day, so it isn’t critical for her to accept the Spooker instantly. The best time of day to put the Spooker on is right after that day’s egg has been laid, usually in the morning. 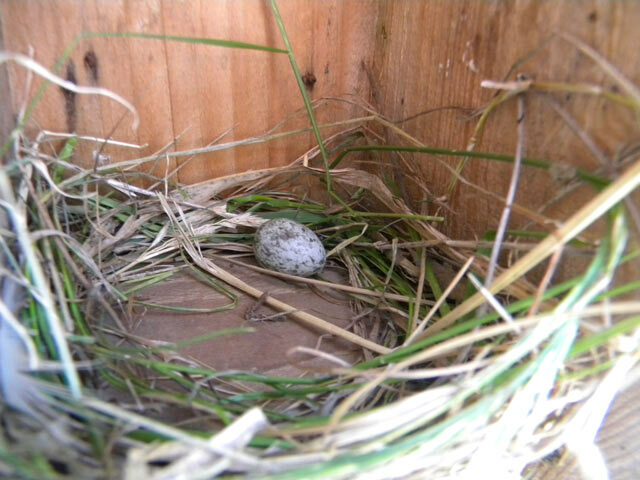 Then the female has all day to get used to it before she must enter the nestbox to lay the egg on the next day. Some people have reported success with using a monofilament HOSP deterrent. It must be done carefully. What other birds compete with Bluebirds for nestboxes? Please consult Competitors page for information on a number of common cavity nesters that may compete with Bluebirds.